Order from PlaidHatGames.com and receive a free alternate promo card! Your mother Columbia cries out as foreigners and anarchists threaten her virtue - will you not take up arms and defend her? Will you usher Columbia toward salvation or ruin? 1912. The magnificent floating city of Columbia, intended to be a shining symbol of American exceptionalism , has been disavowed by the very nation that created it. Part world's fair and part battleship, Columbia has erupted into civil war as two sides vie for control of the most important city on Earth. The nationalistic Founders seek to prove that Columbia is even more American than its motherland, and the anarchistic Vox Populi seek to burn the floating city out of the sky. Caught in the middle of the infighting is disgraced former Pinkerton agent Booker DeWitt, and Elizabeth, a mysterious young woman fated to be Columbia's salvation or the bringer of its doom. 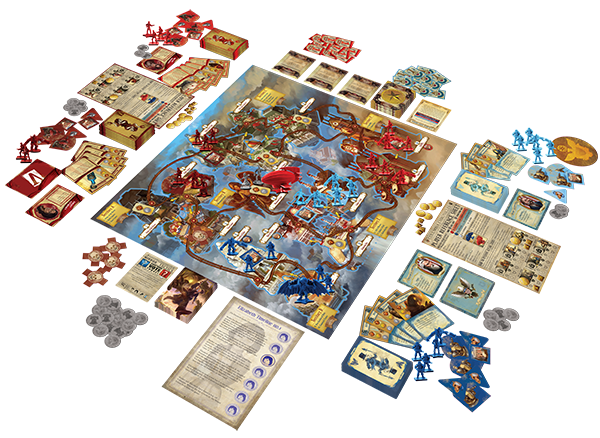 BioShock Infinite: the Siege of Columbia board game is based on the exciting BioShock Infinite video game. Set during the same series of events as the video game, players take on the role of the Founders and Vox Populi factions, desperately seeking to seize control of Columbia. Players will command mobs of combatants and set them against their opponents, striving to lay claim to the city's bitterly contested districts. Challenging objectives offer tempting advantages, as each side uses their might, influence and resources to claim victory. The Sky-line: Will your troops ride the rails to cut off enemy forces, or will they zip blindly into a trap? 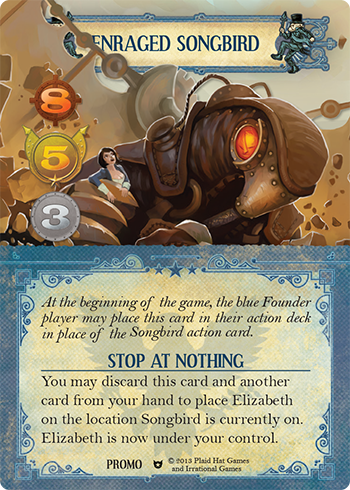 Booker & Elizabeth: Unpredictable and dangerous, Booker and Elizabeth will force players to reconsider their strategies as the two cut a path through the burning city. Powerful Leaders: Command important characters straight from the video game, such as the nihilistic Daisy Fitzroy, or the terrifying Songbird. Tightly-balanced Resources: Will you overwhelm your enemies with superior numbers, or will you focus on controlling the conditions of the war? 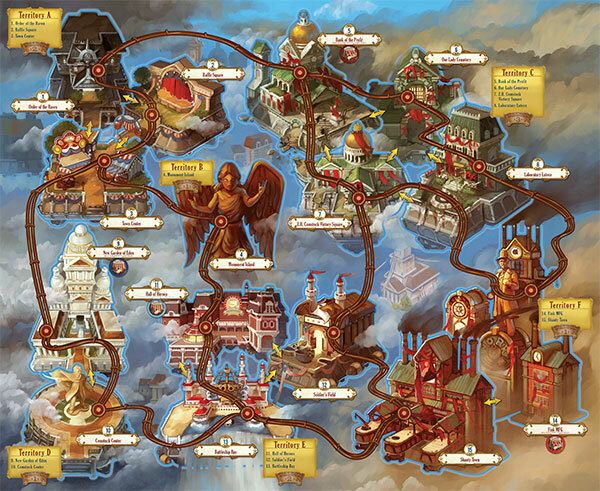 BioShock Infinite: the Siege Columbia forces players to make tough decisions at every turn. The rulebook is available for download here at PlaidHatGames.com. Click here (or right-click and choose "save link/target as..." for the 24-page, full color download. NOTE: The rulebook includes minor SPOILERS in regards to game locations and the general flow of the plot. The Collector's Edition of BioShock Infinite came with an extra Founders Handyman figure. For special rules regarding this figure in The Siege of Columbia, download this extra rules sheet. Click here to download the rules that come in the box.